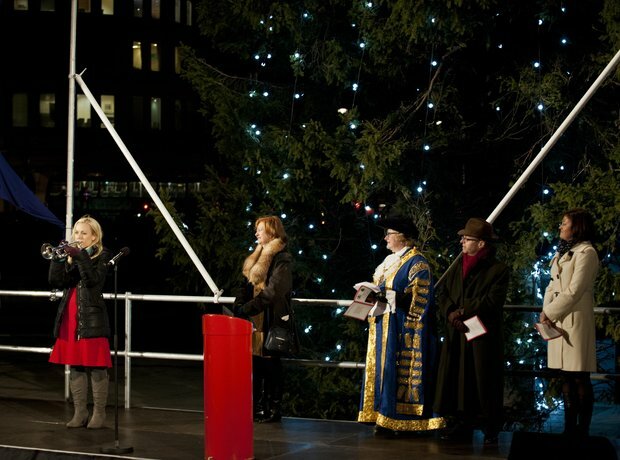 Trumpeter Tine Thing Helseth celebrated the arrival of the Norwegian Christmas tree in London, with choral performances and carols from the choir of St Martin in the Fields and the Salvation Army. Tine plays In the Bleak Midwinter on stage on Trafalgar Square to celebrate the lighting of the tree. Before the Norwegian tree was lit, Tine posted a picture of herself on Twitter ahead of her sound check. Trumpeter Tine and the Lord Mayor of Westminster, councillor Angela Harvey shake hands on stage in front of the tree. Tine also performed at the Regent Street Christmas lights, with singer Noah Stewart. The view from afar, as the beautiful lights bring London's Trafalgar Square to life. Tine receives a well-deserved round of applause after her performance of In the Bleak Midwinter. Members of the choir of St Martin in the Fields sing alongside Tine Thing Helseth, performing The First Nowell and The Holly and the Ivy. Measuring an impressive 52 metres, the tree towers over the performers on London's Trafalgar Square. The tree will remain lit until the Twelfth Night of Christmas, 6 January.